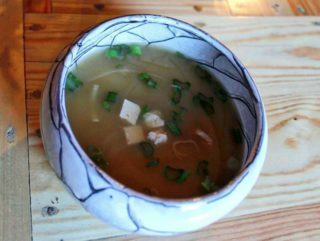 Soup for the soul, created from fermented soybeans and sea salt, served with tofu and spring onions. Vegan meal. 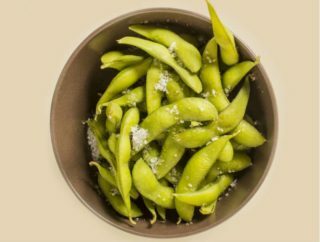 Salted young soybean pods. Vegan meal. Fresh seasonal vegetables fried in light flour batter. Vegan meal. 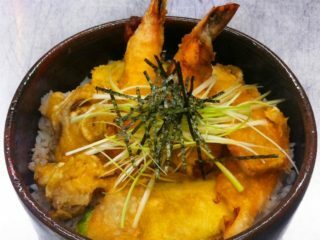 Two large black tiger shrimps and fresh seasonal vegetables in light flour batter. 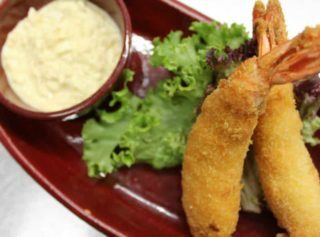 Two large panko-coated black tiger shrimps served with chunky homemade tartar sauce and leafy vegetables. 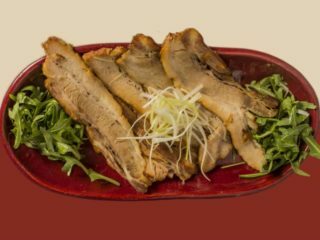 Marinated grilled pork belly slices 100g with leek and rucola. 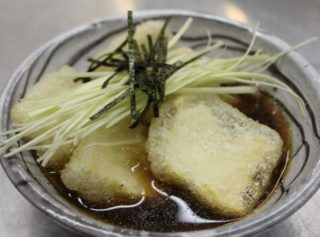 Lightly deep-fried fresh tofu dusted with potato starch and served in a cooled tentsuyu broth, 5 pieces. Vegan meal. 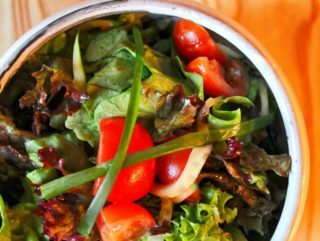 Mixed lettuce, cherry tomato and cucumber served with sweet lime dressing. Vegan meal. 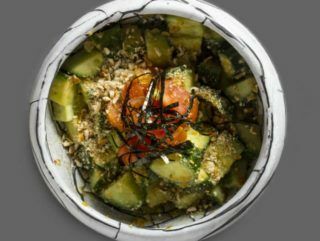 Cucumbers and diced tomatoes with japanese sesame dressing and pretzel garnish. Vegan meal. 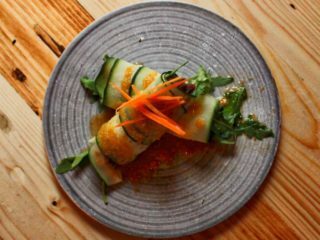 Marinated pork belly slices wrapped in fresh cucumber topped with sesame dressing, 3 rolls. 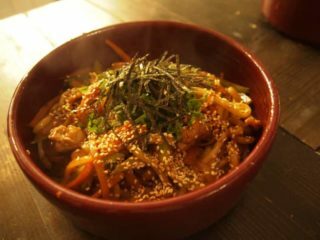 Wheat noodles 200 grams. 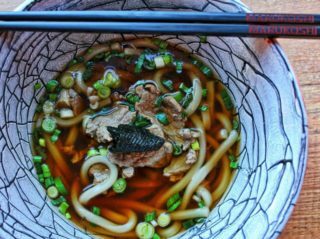 Noodles and soup are packed separately. Bathed in vegan miso broth, topped with tofu, corn, red bell pepper and nori. Vegan meal. 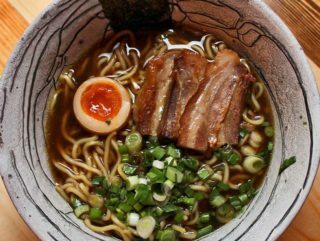 Bathed in slow-cooked soya-pork broth, topped with pork belly slices, boiled egg and nori. 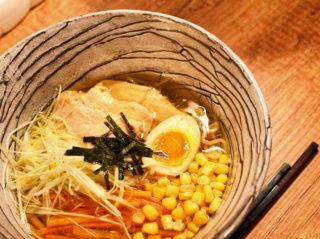 Bathed in a clear chicken and blended salt broth, topped with spicy baby shrimp, marinated egg, leek, grilled garlic paste, corn, carrots and shredded nori. 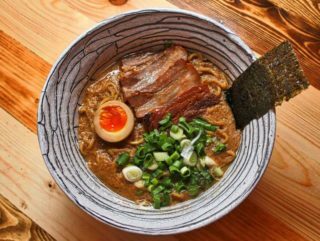 Bathed in miso broth, topped with pork slices, marinated egg, corn and nori. 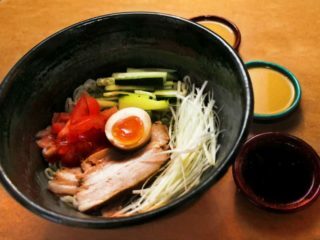 Cooled ramen noodles (hiyashi chuka) flavored with your choice of soy-vinegar, sesame, or miso dressing, topped with spicy shrimp, marinated pork belly slices, shredded omelet and fresh summer vegetables. 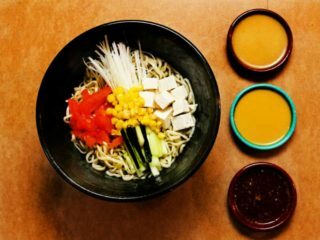 Cooled ramen noodles (hiyashi chuka) flavored with your choice of soy-vinegar, sesame, or miso dressing, topped with cubed tofu, corn, leek, tomato, cucumber and rucola. Stir-fried in shoyu-based tare with fresh zucchini, carrot, onion and cabbage. Vegan meal. 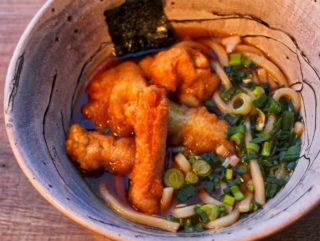 Udon noodles in a lightweight soy-dashi broth topped with seasonal vegetables fried in tempura batter. Vegan meal. 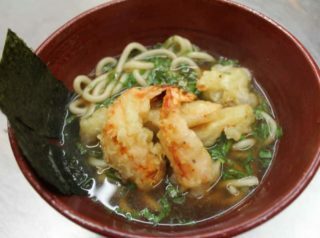 Udon noodles in a lightweight soy-dashi broth topped with two large black tiger prawns and seasonal vegetables fried in tempura batter. 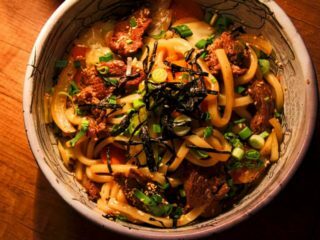 Udon noodles in a lightweight soy-dashi soup topped with thin slices of ribeye steak and spring onion. Stir-fried in shoyu-based tare with ribeye steak slices 120g, fresh zucchini, carrot, onion and cabbage. Stir-fried in shoyu-based tare with seared chicken thigh 120g, fresh zucchini, carrot, onion and cabbage. 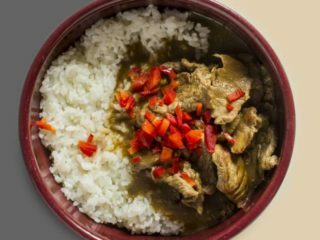 Chicken 120g curry served with rice and green peas, topped with chopped bell pepper. Beef 120g curry served with rice and green peas, topped with chopped bell pepper. 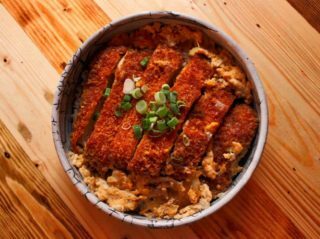 Panko-breaded pork cutlet 190g served with mild japanese curry, spring onions and your choice of japanese rice or leafy salad. 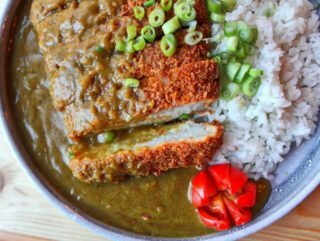 4 panko-breaded potato croquettes served with mild japanese curry, spring onions and your choice of japanese rice or leafy salad. Vegan meal. 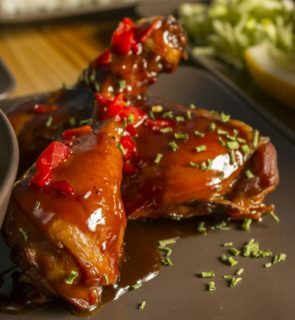 300g of grilled chicken leg and thigh marinated in teriyaki sauce served with steamed rice or leafy salad. 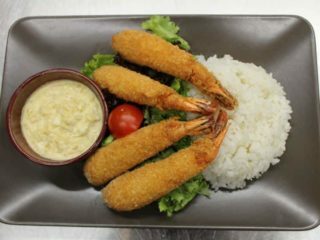 4 large panko-coated, deep fried, black tiger shrimps served with homemade chunky tartar sauce, rice and leafy vegetables. 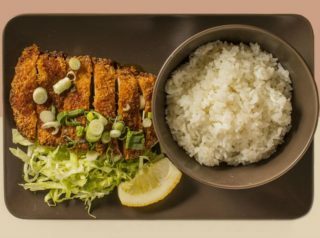 190g of panko-breaded pork cutlet served with tonkatsu sauce, shredded lettuce and spring onions, served with steamed rice or leafy salad. 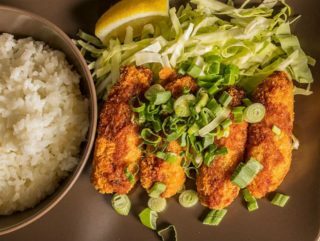 4 panko-breaded potato croquettes served with tonkatsu sauce, shredded cabbage and spring onions, served with steamed rice or leafy salad. Vegan meal. 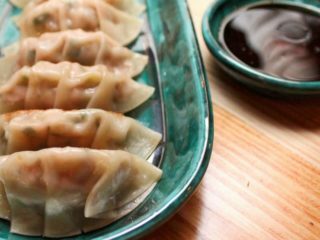 Thin dough pockets filled with minced pork, cabbage, spring onion and oyster sauce, served with gyoza dip. 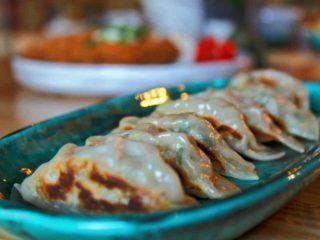 Thin dough pockets filled with mushroom, leek, carrots and sesame oil, served with gyoza dip. Vegetarian meal. Vegetable gyoza and pork gyoza. 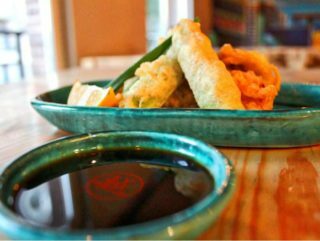 Fresh seasonal vegetables fried in light flour batter, topped with fresh spring onions and leek. Vegan meal. 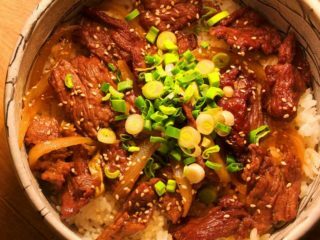 Ribeye steak 200g and onion donburi, topped with fresh spring onions and chopped red bell pepper. 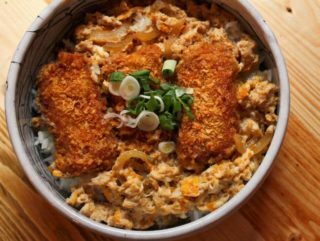 Panko-breaded pork cutlet 190g cooked with egg and topped with spring onions. 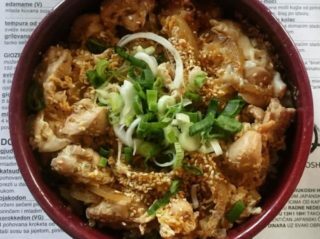 Pan-seared chicken 170g, egg and onion donburi topped with sesame and fresh spring onions. 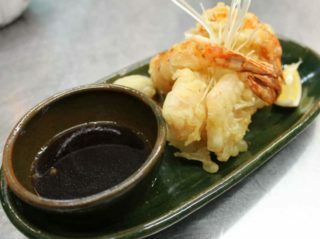 Two large black tiger prawns fresh seasonal vegetables fried in light flour batter, topped with leek and spring onions. 4 panko-breaded potato croquettes cooked with egg, topped with fresh spring onions. Vegetarian meal. 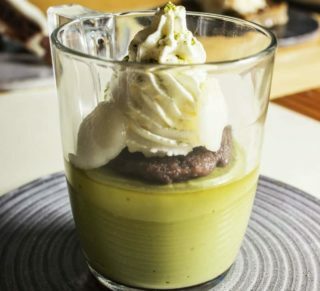 Creamy handmade matcha ice cream served with japanese jelly cubes (kanten), topped with powdered plazma biscuit. Hand-folded japanese chewy rice bun with sweet red bean paste filling. 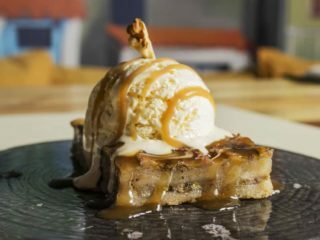 Served warm with handmade vanilla bean ice cream and caramel sauce. 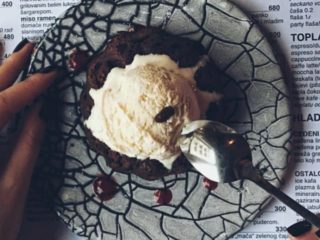 Warm fondant au chocolat (lava cake) topped with handmade vanilla bean ice cream. 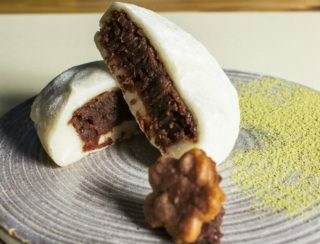 Japanese custard made from coconut milk and green tea, topped with sweet red bean paste and chewy rice balls (shiratama). 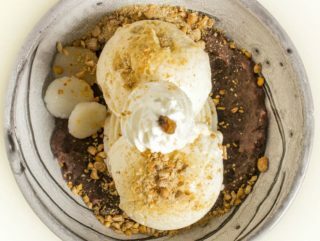 Handmade vanilla bean ice cream topped with chewy rice balls, sweet red bean paste (anko) and roasted soy bean powder (kinako).